Is it hard to keep your toddler busy during the day without going crazy? What about your preschooler? I’ve heard from so many parents that what they need even more than a strong cup of coffee is an accessible list of easy activities for their 2 year old (or 3 and 4 year olds!) that they can put together instantly! Like, with zero prep time! And with stuff they already have (for heaven’s sake!). Well, I’m answering that call. When I realize that I’m on the losing end of helping my kids stay engaged without electronics, It takes too long to scroll through a long list of various activities to find something else to do and then I don’t even know if I have all the supplies! I’d love to see a short list of things to do that doesn’t require any supplies (or just basic household things). Does this sound like you, too? 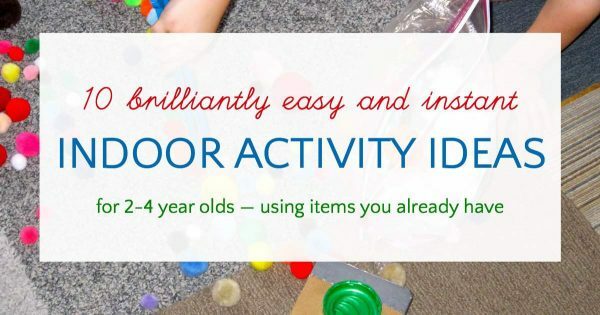 These are all intensely easy activities for 2-5 year olds that any parent can set up with no fuss at the drop of a hat. AND I’ve put a link to a printable list at the bottom of this post. So you can print it out and stick it on the fridge. 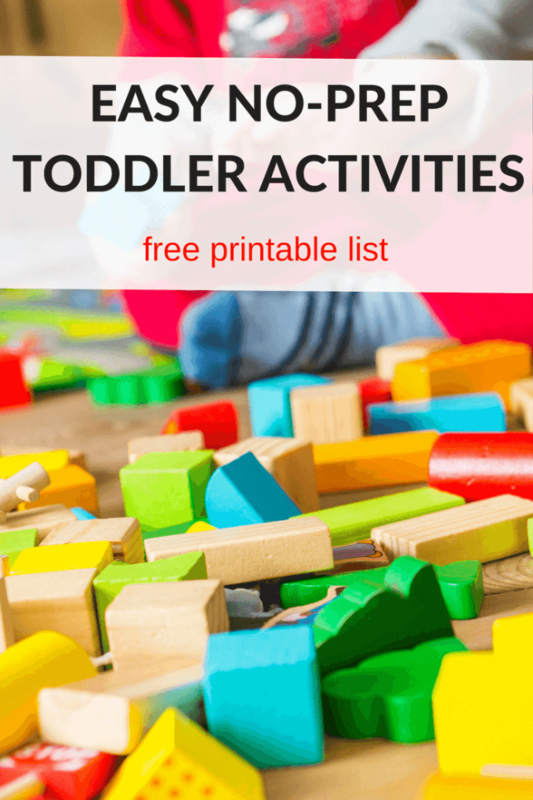 No more scrolling through activity lists to find an easy idea for your toddler or preschoolers. YAY! Please note: toddlers and preschoolers should always be supervised. Please use common sense and your own judgement when trying one of these fantastic ideas. 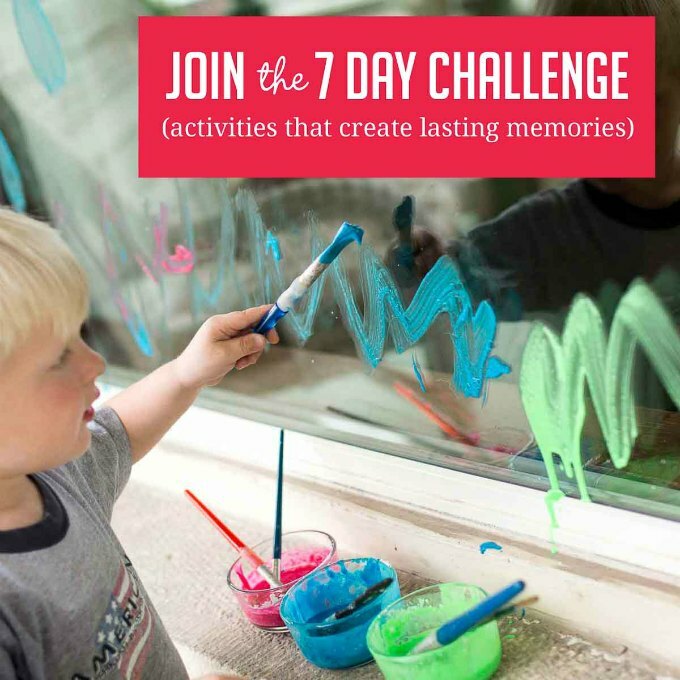 One of my favorite easy activities for toddlers and preschoolers! Sort anything! Kids love, love, love this. And you can use anything you have and sort by size, shape or color. Large items: spoons, plastic bowls, blocks, large plastic lids, large LEGO. Small items: (not for kids who put items in their mouths) buttons, beads, shells, plastic bottle tops. Tip: Use a muffin tin or a series of small bowls. Bonus extension: Cut a small hole in the top of large yogurt container and kids can push items through the hole. This is my go-to activity when I have a toddler guest in the house! Here’s a video of how to put it together! Set out a deep tray or bucket full of soapy water. Add in a sponge and your child’s favorite toys like cars or farm animals, or a doll and let them wash. Tip: do this indoors on a large towel or in the kitchen or bathroom. Bonus extension: add in plastic containers so kids can pour and transfer water. Prop up a baking tray on a stack of books and roll down toys and other items! 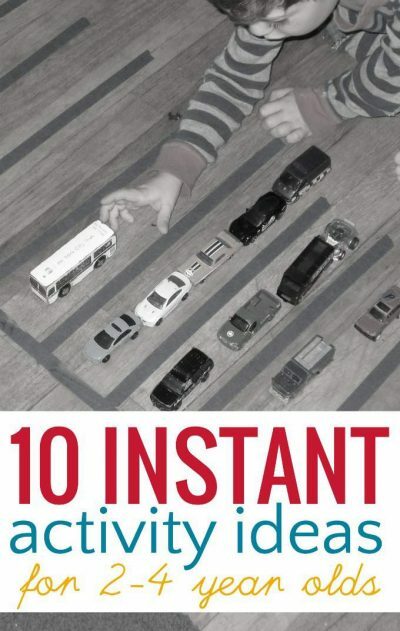 Try toy cars, spools, cylindrical blocks. Tip: set up side by side ramps for racing. Bonus Extension: if you have a set of stairs, inside or outside, use a large piece of cardboard for an even bigger ramp. Tip: place a large cardboard box in the area for kids to collect the scraps into. Bonus extension: give kids a small broom and dustpan and teach them how to sweep up their mess! Fill a tray with rice or dry beans and add in toys or small containers. Tip: for frugality you can reuse your sensory material. Just pour the rice into a large container or zip top bag to save for another day. Bonus extension: mix sensory materials. For example mix up different size and colored beans in the same tray. Give your child a large stack of plastic or paper cups and challenge him to build towers with them. Tip: wash and dry any to-go cups you get and keep them in a storage container or bag so kids have a variety of sizes to experiment with. Set up a bin or box on one side of the room. Toss balled up socks or crumpled newspaper into it. Tip: Let kids create their own “balls” by crumpling the newspaper themselves. Bonus extension: Set out receptacles of different sizes. Or, if you have a cardboard box, turn it into a carnival game. If you don’t already have a ball of play dough, it’s worth taking the time to make a batch to have on hand (it’s okay to buy it too!). Then set out the play dough but include an add-on item that kids have not previously used. Novelty is everything! Ideas include: toothpicks, acorns, LEGO blocks, pipe cleaners, craft sticks, buttons, old marker tops. Here’s a list of 42 add-ins that will work fine motor skills. Tip: use imaginative mats like these free, printable play dough mats from Picklebums. Bonus extension: hide objects in a ball of play dough and challenge kids to dig them out! 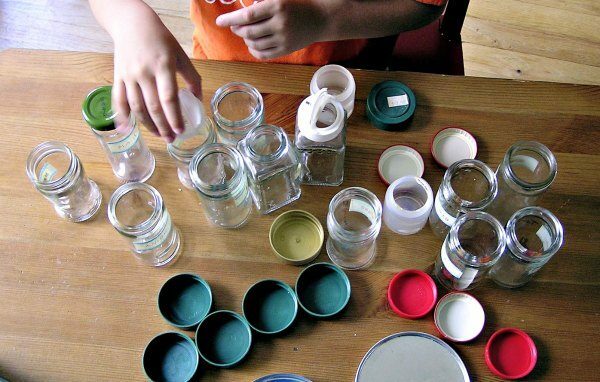 Empty out your entire bin of plastic storage boxes and let kids match the lids to the container. Tip: keep recyclables like yogurt containers and plastic bottles with lids for this activity. You can also use spice jars. Bonus extension: kids can also build and stack with these containers (if they are plastic). Set out two bowls, one filled with water, the other empty. Kids use a sponge to transfer water from one container to the other. Dip in the sponge, and squeeze the water out. Kids love the squeeeeeezzzzzing part! Tip: this is an excellent activity if you want your kids to stay seated at the table. Bonus extension: water droppers are one of my essential play items. If you have one, they can transfer water with the dropper. GET THE PRINTABLE CHEAT SHEET! Enter your email below and we will send it directly to your email. All these sound great, but I am sure very messy. Thankfully I no longer have any toddlers. But I can assure you that the rice or beans would have gone straight on the floor and the bucket of water for washing toys tipped over instantly. Maybe my kids were just plain naughty when they were toddlers! Love these ideas, I’ll try some, my toddler will love these. I can’t stand kids being on phone or pads. Thank you for sharing. ? Great! I hope your toddler has a great time with these play ideas. Thank you for the fantastic ideas! Will definitely be trying a few of these with my super active 3 year old. I especially like the videos/photos as sometimes it’s hard to picture it. We always have rice, corn starch, grits, or something similar for my little guy to play in. I spend a lot of time in the kitchen so I put down a vinyl table cover on the floor, fill a giant pan with whatever “snow” (that’s what he calls it) and invite him to bring his toys over. It calms him down and we are close to each other, which allows me to, at least, verbally participate in play time. So worth any mess! We even have car washes after he’s done, which usually ends in mopping the floor, lol. Shaving cream and foam blocks is another favorite messy activity we have been enjoying. Thank you for sharing some new activities for us to try! !